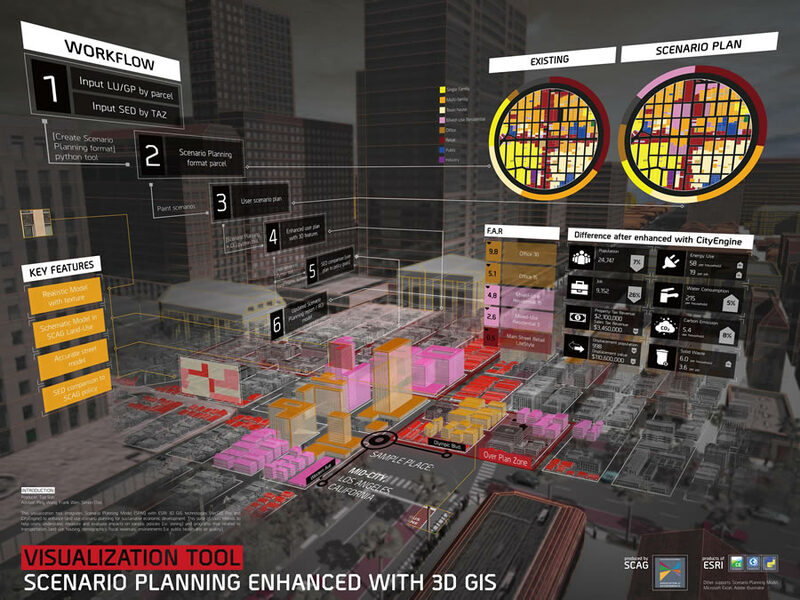 We are living in an exciting age for GIS and cartography. Maps are being used in new and innovative ways to solve a wide array of problems and challenges. To celebrate the ubiquitous nature of maps, Esri User Conference (Esri UC) attendees are invited each year to share their work in GIS and cartography. Hundreds of Esri users display their very best mapping efforts in the Map Gallery during the Esri UC. It’s a remarkable collection of work. This year, nearly 700 maps were submitted for the Map Gallery and judged by Esri staff. Here’s a list of the winners. 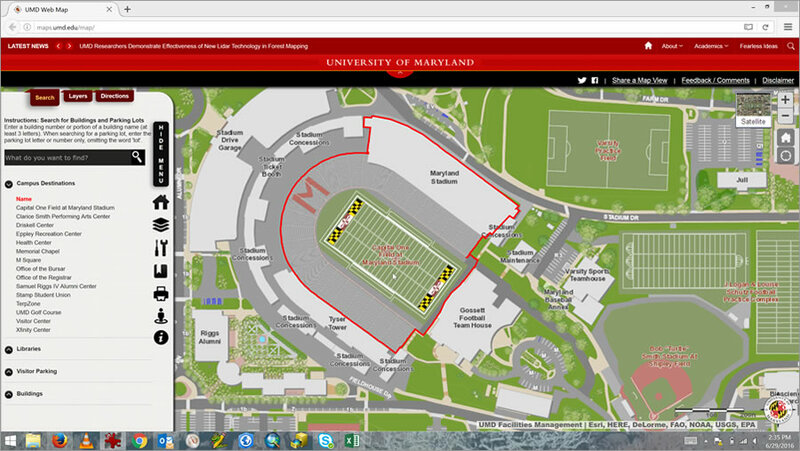 The University of Maryland Interactive Campus Map by the University of Maryland won the award for Using an API in a Map because of this map’s ability to leverage many of the powerful capabilities of the ArcGIS platform through the API. This map has a clean interface and contains a wealth of information about the campus on-demand via pop ups. This year’s fantastic collection of student map entries left a strong impression on the judges. These maps did more than simply plot data. They used analysis to generate understanding, explored the power of the ArcGIS platform, and communicated insights clearly and convincingly. Samantha Hmelovsky, a student at Sunrise Drive Elementary in Sayville, New York, won in the Student Map Under Age 13 category for her poster on The Effect of Dissolved Oxygen and Nitrate Levels on Organisms in the Carmans River. The river is in Long Island, New York. The United States Environmental Protection Agency (EPA) won Best Story Map for Ten Things to Know About EPA’s Clean Power Plan. This Story Map Journal makes good use of fonts and colors in the side panel. Links in the text drive the appearance of the map, drawing readers in further. 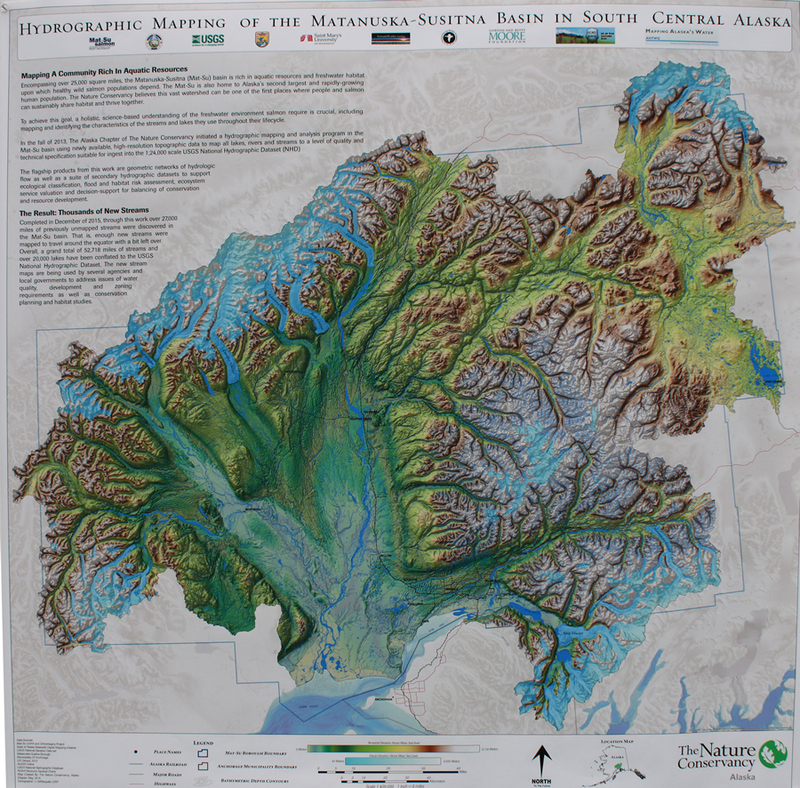 The Nature Conservancy won Best Large Format printed map for Hydrographic Mapping of the Matanuska-Susitna Basin in South Central Alaska [PDF]. The map made great use of a number of cutting edge data products including the new United States Geological Survey (USGS) national hydrographic database, airborne lidar data, and nautical charts. The exquisite cartographic design emphasized beautiful 3D terrain and mapped many miles of previously unmapped streams. The perennial challenge for mapmakers that vie for Best Small Format printed map is always how to make maximum use of limited space and condense large amounts of data into a clear, concise map portrait. The Vermont Agency of Transportation won for Saratoga Spa State Park- Cross Country Ski Trails [PDF] for its good color balance, easy to read content, legible labels, and intuitive symbols. The Republic of Turkey’s General Directorate of Highways won the People’s Choice Award for its poster, GIS Based Investment Management Systems. The poster shows how ModelBuilder is used to monitor and predict needs of the national highway system. ModelBuilder is a visual programming language for building geoprocessing workflows that is available in Esri ArcGIS for Desktop’s ArcMap and ArcGIS Pro. This winner is voted on by conference goers themselves and is always a nice achievement for any author. 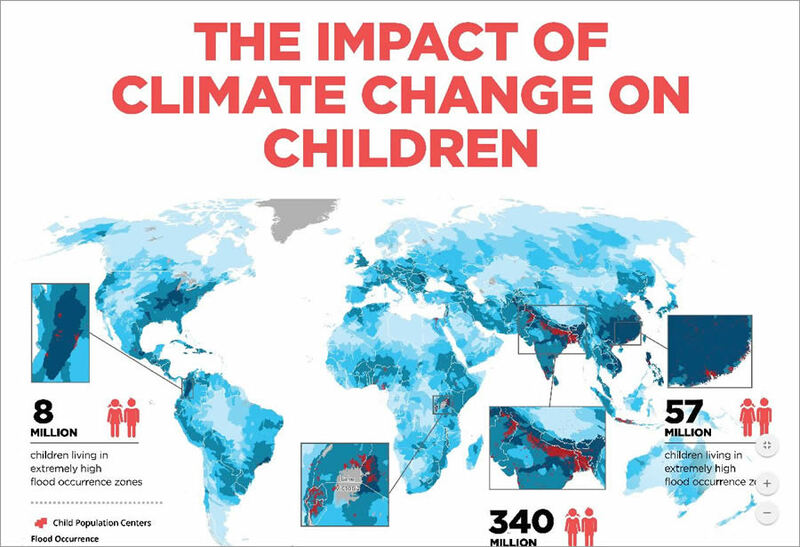 Impact of Climate Change on Children by UNICEFwas recognized by the judges for its powerful, stark design on a relevant, topical subject. This work delivered a high impact, strong message with clarity and effective simplicity. 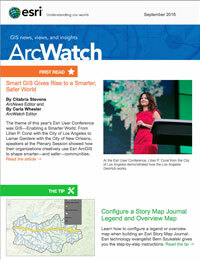 The User Application Fair at the Esri UC offers the opportunity to recognize the latest, emerging GIS technology. This year’s award went to the Unidad de Planificación Rural Agropecuaria (UPRA) for its Script for Grouping Polygons through Accumulated Magnitudes. The GeoNet MVPs are the most active members of Esri’s GeoNet community in the past year. These awards recognize the most active members of this online group who bring an energy and spirit that makes the community a better place for the rest of us. Robert Scheitlin won first place, Dan Patterson took second place, and Rebecca Strauch won third place.